Card base: 3" x 6" Whisper White CS (100730), score at 3" and fold in half. Use Ticket Corner Punch (119867) on all 4 corners. Cut a piece of Basic Black CS (121045) that measures 2-3/4" x 2-3/4". Use Ticket Corner Punch (119867) on all 4 corners and adhere to card base with SNAIL Adhesive (104332). 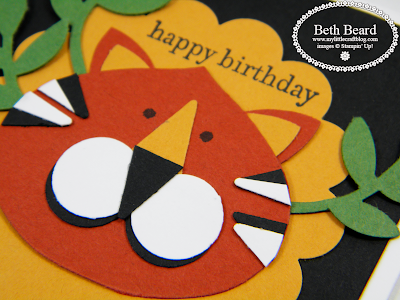 Lion Head: Using Ornament Punch (119847) punch out ornament in Cajun Craze CS (119684). Trim off the little piece at the top (ornament hanger) and use Sanding Block (124304) to smooth. Turn ornament upside down. Ears: Using the Blossoms Builder Punch (121808) punch out 2 of the smallest petals in Cajun Craze CS (119684) and 2 more of the smallest petals in More Mustard CS (100946). Layer 1 More Mustard petal onto 1 Cajun Craze petal adhering with SNAIL. Repeat this again for the other ear. Attach both ears to back of the head with adhesive. Mouth/Cheeks: Punch out 2 - 1/2" circles in Basic Black CS(121045) and 2 more in Whisper White CS (100730). Attach each Whisper White 1/2" circle over each 1/2" Basic Black circle leaving a small portion of the black showing. Adhere both of these to the face with the black portion at the bottom to look like his mouth. Nose & Stripes: I took Basic Black CS and used the Star punch (retired) to punch out a small triangle for the nose. Then another small triangle in More Mustard CS for the upper section of the nose. The stripes were also done the same way. But I found it much easier to attach a small strip of white CS onto the black CS and punch out a triangle where the 2 pieces meet. NOTE: If you do not own a Star punch you can cut tiny triangles with paper snips, regular scissors or insert a small piece of the card stock into the corner of a square punch. Eyes: I made 2 dots with the brush tip of a Basic Black Stampin Write Marker (100082). Leaves: I punched out 3 sets of branches/leaves using the Bird Builder Punch (117191) in Garden Green CS (102584) and attached to the back of the head/face with adhesive. Attach head/face to More Mustard 2-3/8" Scalloped Circle & attach that to card base. 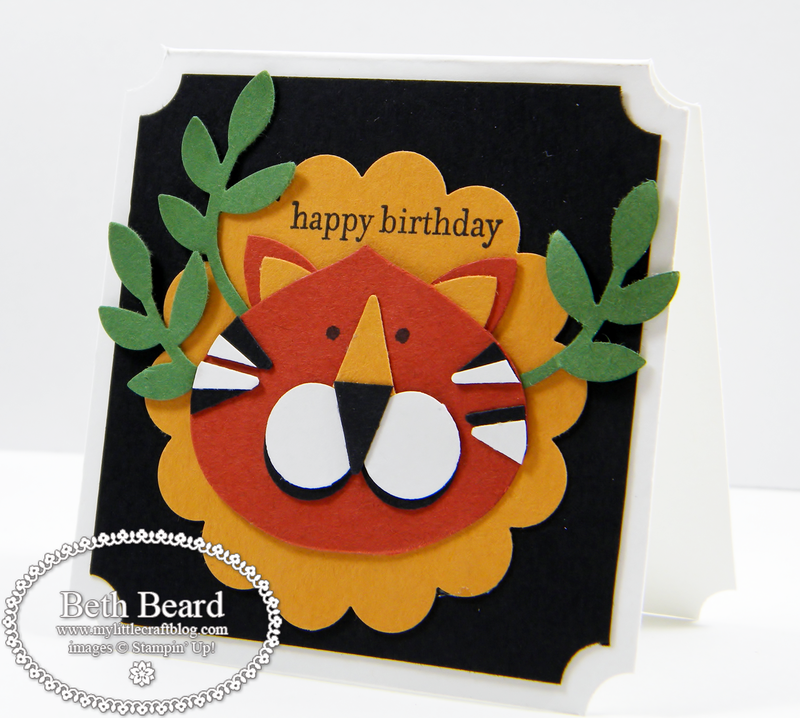 Greeting: Using Black StazOn ink (101406) stamp Happy Birthday from Teeny Tiny Wishes stamp set (115370). If you would like to PRINT / SAVE a pdf copy of this post, please scroll all the way to the bottom of this post and click on the PRINT button to the left of my signature. Plus, if you have any questions, please let me know. Rip roarin' fun that card is grrrreatttt. I understand you got an award. Congratulations it's through Linda's blog that I'm here. Let's hope this stimulates visitors. I'm a new follower and subscriber too! Really creative - you've done such an awesome job with your punch art! This is so cute. Thank you for sharing how you did this. Wonderful - so very cute! Thank you for the time it took to put the instructions out there for the rest of us!